Stone Engraver CNC Routing Machine finds extensive usage in the processing of wood, acrylic, MDF etc. We are recognized among the leading Importers, Exporters and Suppliers of Stone Engraver CNC Routing Machine from Ahmedabad, Gujarat. The Stone Engraver CNC Routing Machine that we offer is highly demanded in the market due to its automatic and simple operations, superior performance and low maintenance. It consists of adopting Linear Square Guide Rail that can adjust gap & change track. It has a cast iron platform with the box structure THAT ensure rigidity AND precision. It is known for its efficient processing, high-power spindle motor, low noise, strong cutting. It has compatible type3, artcam, castmate, proe, ug, wentai etc. It consists of power restored, power outages continued carving, processing time forecast etc. 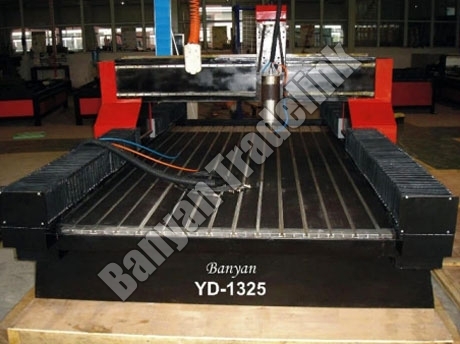 The functional life of Stone Engraver CNC Routing Machine is minimum 10 years.